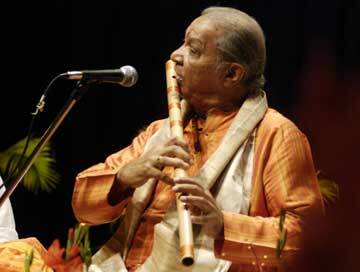 Pandit Hariprasad Chaurasia is known internationally as the greatest living master of Bansuri, the North Indian bamboo flute. Chaurasia is among a few but growing classicists who have made a conscious effort to reach out and expand the audience for classical music. He is probably the most accessible Hindustani musician who has done a lot to popularize Bansuri and classical music among the masses. Pt Chaurasia performing stage in Jammu University on Tuesday on the first anniversary of Zeneral Zorawar Singh auditorium.